So how do you turn cheap and readily available cabbage, carrots and onions into something which tastes good? The answer is to mix them with smooth and creamy coleslaw mayonnaise to make a dish which is creamy yet crunchy and provides a high calorific energy source with vegetable nutrition. Adding coleslaw mayonnaise has the additional effect of covering and acidifiying the vegetables – prolonging the life of the finished product. Originally, 80% oil would have been used in the mayonnaise but as the dish became more popular, this made production more expensive. However, by reducing the oil content, the mayonnaise produces a viscosity similar to milk, so the creaminess is lost. Adding starch to thicken the coleslaw mayonnaise is one solution, but care needs to be taken when mixing with chopped vegetables as the enzymes released could cause the mayonnaise to thin. We have the specialist know how to help you develop lower oil content mayonnaise products which will work in coleslaw. Hydrocolloids are used to thicken the mayonnaise instead of traditional starches, because they are immune to the effects of amylase enzymes. 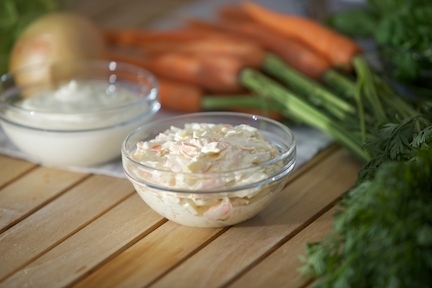 This allows food manufacturers to reduce the oil content of mayonnaise used in coleslaw – meeting the requirements of more health conscious consumers. Contact us to today discuss your new product requirements. KaTech’s technical team is dedicated to helping you overcome the problems which can occur in the production of coleslaw mayonnaise. Watering out, loss of creaminess and low shelf life can all be avoided – and we can show you how. Contact us to discuss how we can help you with any issues you may be having with your products. Cutting the cost of coleslaw mayonnaise production usually involves reducing the oil content. As the expensive oil content is lowered, however, the water content of the mayonnaise is increased. This can result in watering out problems when the neutral vegetable’s proteins are denatured by the acidic dressing causing a loss in water holding capacity. One solution is to use guar/xanthan combinations to control water release by delayed action swelling. Guar is, however, a natural ingredient and crop yield is dependant on monsoon rainfall falling at just the right time and by supply and demand from the oil industry. Being able to deliver more than one form of solution means we can deliver alternative solutions during periods of high raw material price volatility. We can help you implement alternative ways to reduce the oil content of your mayonnaise while avoiding watering out problems. Contact us today to find out how we can help you produce a better quality coleslaw mayonnaise for less.